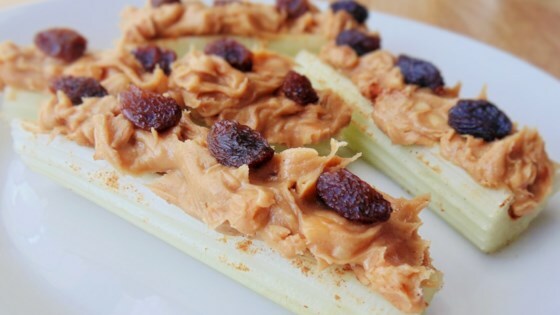 "Cinnamon adds a flavor twist to a favorite snack kids love to make themselves with celery sticks, peanut butter and raisins." Place the celery pieces on a clean surface, hollow part facing up, and sprinkle evenly with cinnamon. Spoon peanut butter into the hollow, and arrange raisins on top. The kids loved making them. I will be making them for the future, great snack idea. Try using dried sweetened cranberries instead of raisins. Red Ants on a Log! It is a nice twist. Fast, simple and very tasty. Loved the cinnamon. My 5 year old who doesn't like celery devoured it. I've had pb with celery before but the addition of cinnamon added a nice touch.